If you're looking for a contractor who can repair your tilting or bowing foundation walls, we at DBS are here to help. We offer warrantied solutions for making all kinds of foundation repairs, including straightening foundation walls. 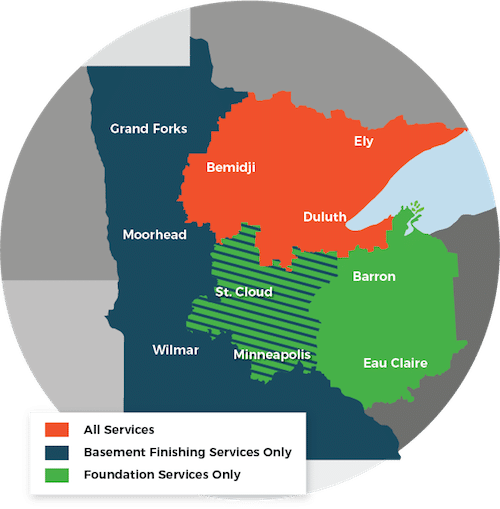 We provide free, no-obligation foundation wall straightening quotes throughout our Minnesota and Wisconsin service area, including Minneapolis, Superior, Duluth, the surrounding areas of Two Harbors, Cloquet, St. Paul, Hermantown, Virginia, Ashland, Esko, and nearby. Call or e-mail us today to schedule your appointment! At DBS, we recommend correcting damage done to failing foundation walls with the GeoLock® Wall Anchor System. To relieve pressure placed on your foundation walls from outside moisture and soils, we at DBS begin the wall straightening process by excavating the soils out from around the foundation. Contact Us For Foundation Wall Repair In Minnesota and Wisconsin! At DBS, we take pride in providing a clean, warrantied solution for homeowners in need of foundation wall repair. To help you decide if we're the contractors for you, we offer free written basement wall repair quotes for property owners throughout our MN and WI service area. We serve the Duluth, Superior, Minneapolis, area, as well as Hermantown, Two Harbors, Cloquet, Esko, Virginia, Ashland, St. Paul, and many outlying areas. To schedule an appointment, call or e-mail us today!